A wide range of junior roles in the marketing industry have seen no growth in salary over the past three years, with wages falling in real terms, according to research from Aquent/Vitamin T.
The trend cuts across creative, digital and marketing role and was only bucked by junior designers, front-end developers and insights professionals. Mike Berry, UK country manager at Aquent/Vitamin T, said: "There’s a lot of people excited by the prospect of working in the creative industries, offering employers a lot of choice at junior levels. This is no doubt a factor in the lack of salary growth in both the past year and over the past three years. 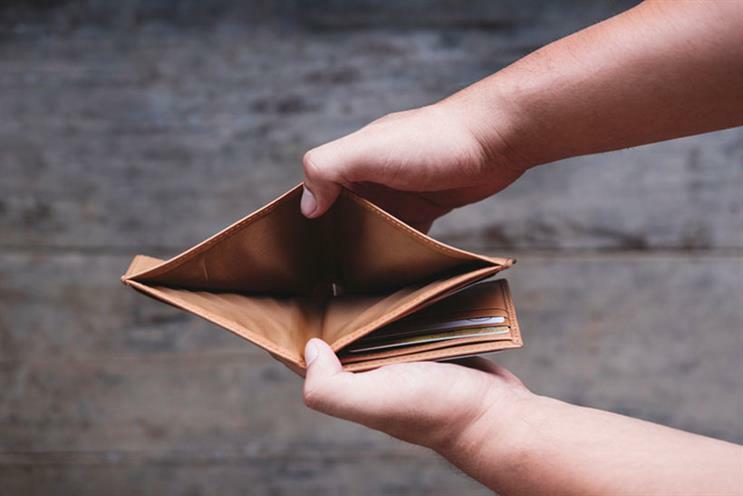 "However, senior people are always in shorter supply, especially in growing marketing sectors, so employers have had to adjust salaries accordingly. Those with ten years or more experience are seeing some large pay rises." According to the research typical pay for junior copywriters, web editors and content editors is clustered around £25,000 while senior content strategists’ are paid about £72,000 on average and those copywriters with ten years' experience have an average pay of £55,000. It is not only junior staff who are feeling the squeeze: salaries for traditional design and writing jobs have also failed to keep up with inflation. In the broader marketing sector there is a mixed picture of salary growth. Senior and mid-level marketers have seen some substantial pay rises with senior insights and analysis professionals seeing salaries go up by a third over three years. Insights and analysis roles at all levels have seen salary increases; with 8% for juniors, and a rise of over a third over three years for senior insights and analysis professionals. Web analysts have seen a 25% increase for the least experienced and approaching 30% for seniors. Social media and community managers have seen salary rises of 5%, raising to 17% for seniors and around 6% for midweight professionals. Meanwhile top-tier CRM marketers have seen a salary rise of almost 30% to £67,500. However, marketing communication specialists have seen their salaries fall 2% in nominal terms to £67,500 (in 2016 the average salary was £69,000). One bright spot in a mixed market was experienced by senior graphic designers and experienced UX professionals have seen some of the strongest salary growth. UX architects have experienced an increase of almost 50% in salary over the past three years and seeing 17% increase since 2017 to an average of £70,000. Senior graphic designers have seen an almost 30% salary increase to an average of £45,000. However, the average creative director's salary has not changed in the past three years, at £92,000. Conversely, middleweight (four to nine years’ experience) packaging designers and artworkers have seen around 10% salary growth over the past three years. But integrated and digital designers have had it tougher with a 3% fall in salaries. Motion graphic designers of all levels have seen a 16% pay increase over the last three years. However, junior salaries remain stagnant and most junior design roles (less than four years’ experience) have seen around a 5% increase in the past year. Berry added: "Employers are keen to recognise and reward talent but they are operating in a challenging market. The overall salary picture for marketing employees is more positive than the broader UK one, where the average salary increase is forecast to be 2.9%." Could the language women use on their CVs contribute to an unequal gender pay gap?